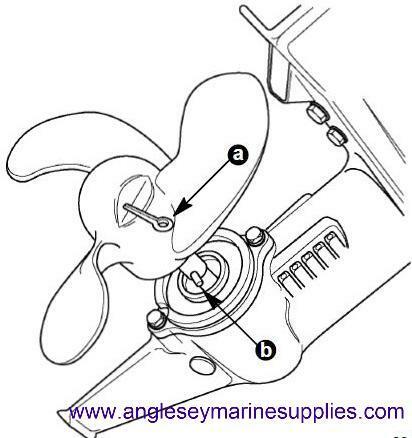 Anglesey Marine Supplies....Online suppliers of outboard engine spares. We supply all makes of outboard impellers..Tohatsu, Honda, Jabsco, Suzuki, Mercury, Johnson, Evinrude, Yamaha and Mariner..We stock them all. Recently added boat outboard shear pins, outboard engine toggle clamps, outboard engine propeller shear pins and outboard tiller arm extensions. 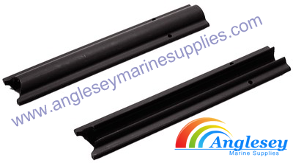 Weld on replacement outboard skegs for outboard engines to 140hp plus v6 mercs and sterndrives, Anglesey Marine Supplies For All Outboard Spares. Many people do this as a part of their annual spring maintenance or winterizing. This is a very inexpensive part that can help keep you engine working properly. If the outboard water pump impeller stops working and you don't notice really soon you might find yourself shopping for a new outboard. Avoid that happening for a very small cost. We stock a large range of outboard impellers to fit most Tohatsu outboard boat engines, please choose the type of Tohatsu impeller you require below. We stock a large range of outboard impellers to fit most Honda outboard boat engines, please choose the type of Honda impeller you require below. We stock a large range of outboard impellers to fit most Jabsco outboard boat engines, please choose the type of Jabsco impeller you require below. We stock a large range of outboard impellers to fit most Suzuki outboard boat engines, please choose the type of Susuki impeller you require below. We stock a large range of outboard impellers to fit most Mercury outboard boat engines, please choose the type of Mercury impeller you require below. We stock a large range of outboard impellers to fit most Mariner outboard boat engines, please choose the type of Mariner impeller you require below. 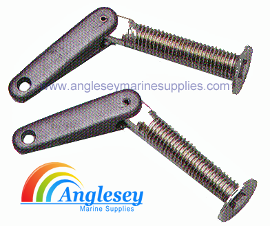 Anglesey Marine Supplies now supply a vast range of boat outboard propeller shear pins for virtually every outboard engine in use. Please use from the selection below. If you cannot find the type you are looking for please contact us for details. Not sure of code number? click on picture for NGK Partfinder. 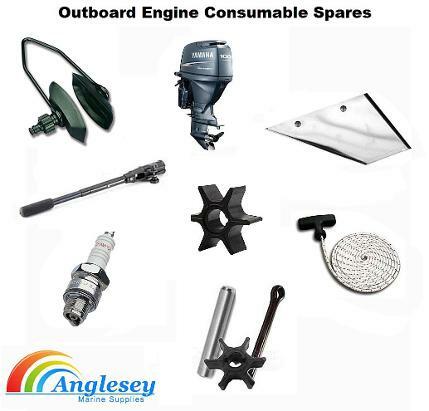 A range of outboard engine spares from Anglesey Marine Supplies. We have recently introduced a full range of boat engine outboard NGK spark plugs for outboard engines, inboard engines and pwc jet skis. 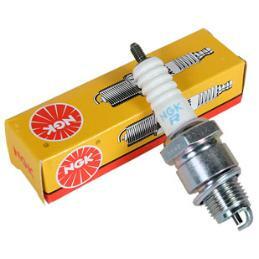 If unsure of type you require please click on the spark plug picture on the left to be directed to the NGK partfinder catalogue. Code Numbers- A6, B5HS, BR5HS, B6S, B6HS, B6HS-10, BR6HS, BR6HS-10, BR6ES, B7S. 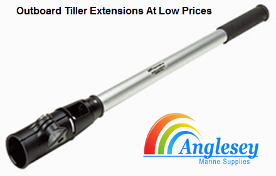 Our outboard tiller arm extension arms are ideal for giving you that extra bit of leverage and also enable steering of your boat from a more central position. Manufactured from anodized aluminium for seawater protecton. 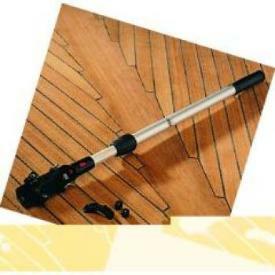 Has a fully adjustable tiller grip. Available in four different sizes. Please use drop bar menu for choice. 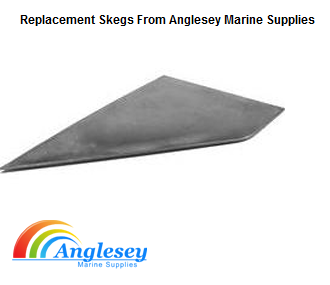 Anglesey Marine Supplies..now supplying outboard engine skeg for outboard legs. Welds on to the lower unit to replace skegs damages due to boat grounding or damage from rocks. Will restore outboard performance and looks. Three different sizes available, please use drop bar menu for choice. 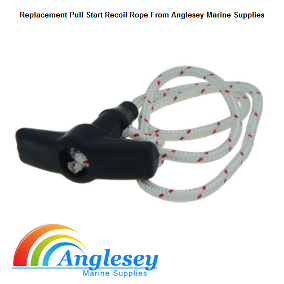 A replacement outboard engine pull cord rope and handle for outboard boat engine recoil repairs. Fits majority of boat engine outboard pull starts. Quicksilver trailering clips to support drive in the tilt up position while trailering. Fits MC-1, R, MR, Alpha & Bravo drives. Is Quicksilver branded and sold in pairs. OMC, Yamaha and Mercury outboard engine transom clamps with threaded bar and cup. Please use drop bar menu for choice. Price is per pair. 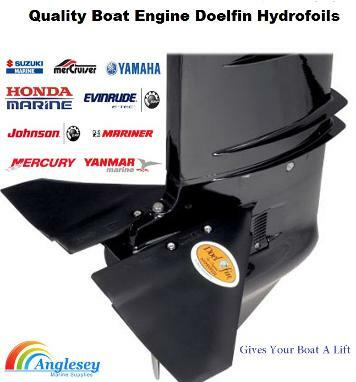 Quality boat outboard engine hydrofoils, give your outboard engine a lift. Enables you to get on the plane more quickly and effortless. Give a more level boat ride.